You're a struggling actor or an assistant to someone in LA and until you hit it big, you're on a tight budget. Well one Penn alum has created something that will be very helpful to all you LA transplants. 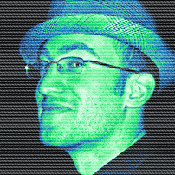 Hillel Smith (C'06, Front Row Theatre Co, iNtuitons Experimental Theatre) started a website with two friends called RentFoodBroke.com, which is a resource site for getting around LA--and getting through life--on a budget. 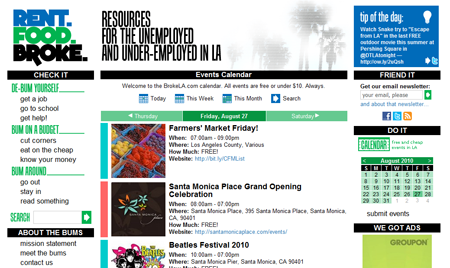 Of note is the site's event calendar, also accessible via the shortcut BrokeLA.com, which only lists events in the LA area that are free or under $10. They also send out a weekly newsletter with links to articles, a rundown of free and cheap events in the upcoming week, and a "Freebie of the Week", a track (or more) from a band playing in LA in the week ahead. Additionally, they feature exclusive promotional discounts for products and shows and sponsor contests and events. "We read emails from users who truly appreciate the site, which is the best feeling of all. We've heard from moms who took their kids to free movie screenings we listed and didn't have to spend $50+ on a family night out, and from new transplants to LA who are finding ways to have fun from our calendar while working for pennies in the mailroom. And we're growing, both in terms of visitors and clout. What caused Hillel to start this site? "I graduated from Penn with the goal of being a graphic designer. I spent a couple years as a presentation designer for a legal consulting firm that specialized in litigation graphics and quit with the goal of taking time off to travel and then find a new job I liked better. The economy suddenly tanking and being unable to find full-time design work when I returned from traveling forced me to rethink how I approached my budget. I repositioned myself as a freelance designer, working on a range of projects including logos, brochures, and event collateral, though my income wasn't what it was when I had healthcare and paid time off. My co-founders had similar stories. What started as a "wouldn't it be cool if..." conversation turned into an actual website, with dedicated readers and fans. We all recognized the need for a resource like this in our own lives--$14 movies are not only unaffordable but are also disheartening--and met that need. And here we are. We have some big ideas for the future and we hope to get the opportunity to make them a reality.